We are a bit closer to achieving our vision if people immediately think of blue lorries and warehouses when it comes to transport, the movement of goods and logistics. 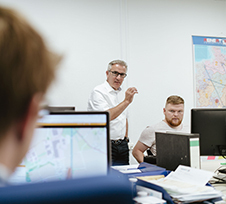 We want to play an important role in the transport and logistics market in Germany and aim at being amongst the top 20 companies by 2015. We offer ‘The special solution’. Our unique network, in combination with the best IT and communication systems, allows us to bundle, optimise and move large volumes in a resource-conserving manner. The ‘optimal movement of goods’ is at the heart of our efforts. Our motto: More volume, fewer resources! We want to help to ‘Positively change the world a little’. We want to be the best where the movement of goods is concerned. There is NO BETTER WAY TO MOVE GOODS. In our present, highly complex and rapidly changing world, hundreds of things have to be done right and developed at the same time in order to be successful. We have summarised this multitude of things in 5 priorities, our key success factors. People, be it customers or staff, come first: ‘From people for people’. 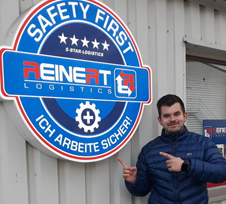 The topic of safety has the highest priority at REINERT and is continuously supported throughout the company. This starts at the safe operation of lorries and ends with the safe delivery of the wares and goods entrusted to our care. We are only successful if our customers are satisfied. Our daily cooperation is characterised by mutual surplus values and loyal interaction for the joint shaping of the future of logistics. 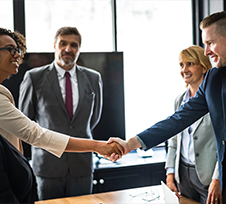 We speak about a win-win situation if the customer and service provider both understand that this important industry must not lose its appeal and importance also in the future. 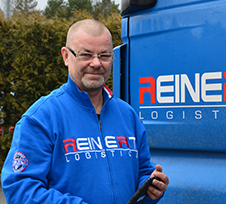 At REINERT people are at the heart of everything and daily assume responsibility for themselves, our philosophy, for thinking and acting in the interest of our customers and our company. Doing the right thing the right way – this is how we see our task in a constantly changing industry. We address the topics of digitalisation, Industry 4.0 and Work 4.0 and continuously improve our know-how. In doing so, we daily invite our employees to contribute to our development of new, innovative solutions. Our motivation: Save resources and do not waste them. We view things in a holistic way to invest in the right areas. Our view of future trends in the fields of alternative fuels, electromobility and autonomous driving is characterised by the innovative idea of optimisation. We want to set benchmarks to have solutions ready for our customers’ highest possible demands! Our daily actions and thinking are guided by respect, trust, fairness, win-win and long-term thinking instead of short-term advantage.